A Note: I’m no longer going to post review summaries, seeing as they are redundant and often pass over points I stress in the bodies of the reviews themselves. So there it is. Saying any more would spoil one of the fantastic action sequences in Nicholas Winding Refn’s brilliant ‘Drive’, an adaptation of James Sallis‘ neo-noir novel. This, like ‘No Country For Old Men‘, is a master class in suspense. What Refn does in silence and stillness is infinitely more effective than the roar and the shake of the generic modern action picture. Here is a film where we can look into a performer’s eyes and see the soul behind them, or the lack thereof, and so much more is said in the pauses than the scant lines of dialog. Here is a film with bright neon and deep shadows, with rumbling engines and the creak of leather gloves. Here is a film where a moment of love and one of violence can occur in frightful sequence stretched out so long we feel we will snap. I daresay, quite pompously, here is a film. Before I go any further, take a look at this two minute clip of the film’s opening sequence on the Cannes Festival site. Now you know what we’re talking about. According to Refn, in an interview with Jeff Goldsmith on the Q&A Podcast, the idea was to translate fairy tale archetypes into a neo-noir setting. Gosling’s Man With No Name character, the Driver, is therefore the Knight, prompted to protect the Damsel, who is played by the stunning Carey Mulligan. But there’s no point in using archetypes, in my view, unless you subvert them, as is par for the course when you’re talking film noir. Refn goes on to describe the now infamous scene in the elevator (you’ll have to see it; probably between your fingers) as the film in a bottle, the central moral conflict displayed at its clearest. It is the ultimate neo noir sequence; it demonstrates the director’s ability to slow down time and extend a powerful, beautiful moment, only to shatter it with an act of brutality, severing the link between the Knight and the Damsel beyond repair, on account of their natures which they cannot compromise. Every supporting performance in the film is wonderfully wrought, but I’d like to further highlight Gosling and Mulligan. They play the two sides of the coin, and share a quietness and an ability to communicate best with their eyes and the slightest movements of their lips. As Refn observes in the Q&A interview, filmmakers and audiences are often scared of silence, and I would add that this is because dialog is the clothing which naked emotion demands. Refuse to cover it, however, and the scene is wrought with suspense; sometimes of the dangerous kind, sometimes of the sexual, sometimes of the moral. If you want to know if your male and female leads have chemistry, put them in a scene together where they cannot speak, but have so much to say. Suffice it to say, Gosling and Mulligan have it, and that tension underlines the whole film. Nicholas Winding Refn clearly understands something so damn crucial to the art that it makes some other filmmakers appear downright pathetic. If you, the hypothetical filmmaker, have a whole movie full of giant robots blasting through skyscrapers with lasers and missiles, and you still can’t manage the visceral shock generated by a single sound in Refn’s film, you’re doing it wrong. Stop making movies. If you’re a filmgoer, however, and you would rather be awash in the mind-numbing, meaningless chaos of a ‘Transformers’ film than seek out the human truth present in films running the gamut between ‘Drive’ and ‘The King’s Speech’, than you should probably stop watching movies. Yes, I know I’m being harsh and leaning hard on hyperbole; but there is nevertheless such a thing as taste, and an obligation as an informed viewer to cultivate the good and shirk the bad. If there’s anything wrong with ‘Drive’, is that it has no business being this good, much less in this market, with ungrateful audiences who will gladly patronize the latest regurgitated fluff and somehow still find room to complain about the lack of original material. Seriously, people; this movie might not be your cup of tea, but it’s a damn sight better than most fare. 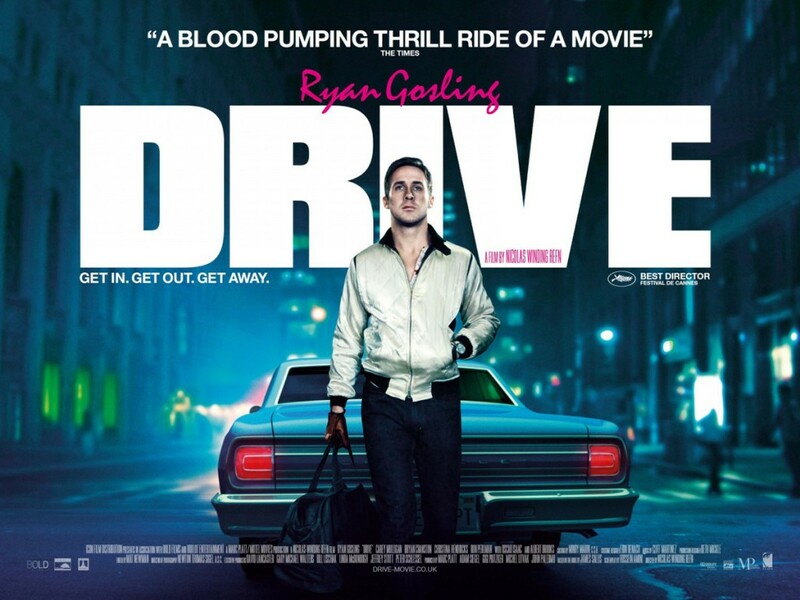 In truth, ‘Drive’ is an anachronism, something you could’ve caught an auteur making in the ’70s and early ’80s. It makes me rather giddy to declare this thing Kubrickian. For further exploration of this film, I recommend, of course, the excellent interview referenced earlier, as well as the hilarious (and insightful) thoughts of Film Critic Hulk; Matthew DeKinder’s review; Laremy Legel’s review; Jim Emerson’s thoughts (though I disagree thoroughly on some points); a very good comment on Emerson’s site; and anything else of repute you happen to find on Google. Summary: A logically opaque, madcap, pretentious, and hilarious genre mashup. Review: To a geek like me, combining deconstructed film noir with a vague science fiction dystopia makes for a beguiling premise. 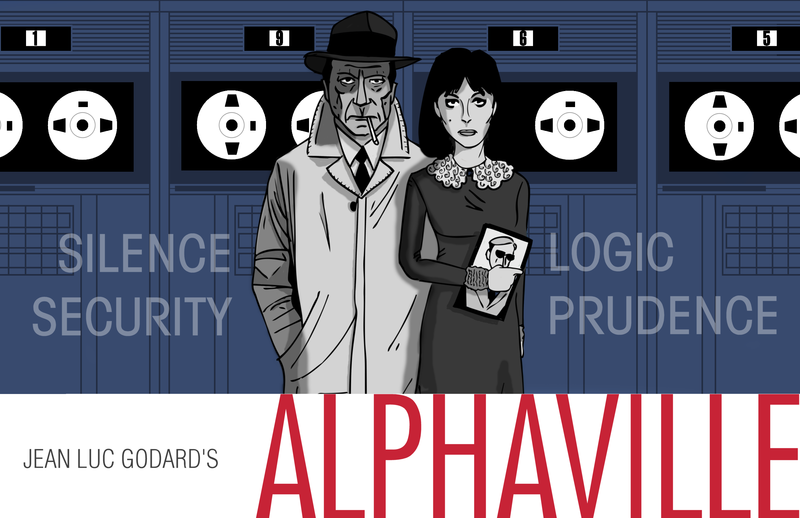 After hearing about ‘Alphaville’ and reading a little about it via the Criterion Collection, I made it my first DVD rental through Netflix, expecting an equally exciting product. Of course, I had overlooked that this is an art film, and moreover it is quite insane. This means it ended up even better than I expected. ‘Alphaville’ moves swiftly from episode to episode, slapping random ideas together like an optimistic French philosopher who is both drunk and convinced that ‘Axe Cop‘ is the next big thing in serious literature. That’s hyperbole, yeah, and it’s cathartic to say it. The point being, it seems the filmmakers weren’t concerned with making the premise seem credible, but they were using it as an excuse to indulge in various kinds of madness. “Tangent” is the word of the day. It’s possible that Godard did find reason for the randomness, however, as the story, in its most vanilla form, could be described as the man of passion (viva la France!) versus the cold logical computer society of tomorrow. A stylistic rebellion against narrative sense, perhaps? The protagonist, Lemmy Caution, a character borrowed from detective novels and films set in an ostensibly more realistic time and place, is summarily transposed, with all his noir tendencies, into the Huxleyian future city of the film’s title. In this setting, the sheer arbitrary nature of his behavior clashes directly with the computer that nigh-intangibly controls everything. It’s like an episode of classic ‘Star Trek’ — the episode ‘Return of the Archons‘ comes to mind — only instead of Bill Shatner lasering zombies we have Eddie Constantine shooting holes in centerfolds. The parallels between ‘Alphaville’ and the previously mentioned ‘Return of the Archons’ are actually pretty striking, as are the differences. Both involve men on a mission, looking for missing persons in a computer-controlled, soulless society. Unlike the Enterprise crew, who wander only because they don’t know where to start, Lemmy Caution does whatever the hell he wants, despite having a clear objective from the get go. The film’s plotting is startlingly opaque. If Lemmy has a grand plan, he doesn’t share it, to my recollection. He’s there to find a couple of people and blow up Alpha 60, the monstrous computer, preventing Alphaville’s influence from infecting other “galaxies”. This being an art film, Lemmy’s solution isn’t bombs or bullets, but unbearable love poetry. It’s similar to James Kirk’s tactic of talking alien intelligences to death, with the writer’s naked ideas as the ultimate weapon. The best way to digest this film is as a comedy, a guilty pleasure packed with odd moments. Judging by its creator’s pedigree, it’s probably not unintentional. It’s not a bad film. In fact, it’s rather brilliant, in a quirky way. It deserves a bigger cult audience than it has accumulated, especially in light of substantially better, relatively recent sci-fi dystopia film noir such as ‘Brazil’, ‘Blade Runner’, ‘Dark City’ and ‘Minority Report’. They all owe an artistic debt to this wonderfully off-kilter classic. I present to you all, today, my editorial entitled A Little Perspective.